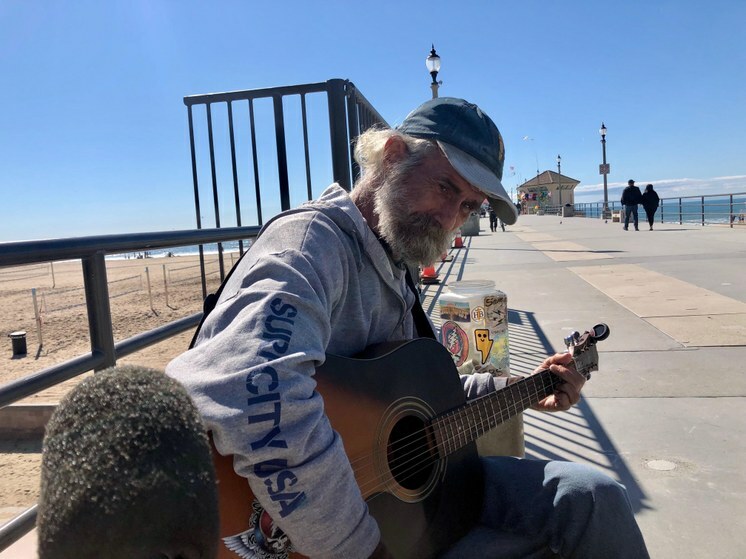 Most days, Mike Carltock earns a little extra cash by playing his guitar and singing on the Huntington Beach Pier. As he performs, the 65-year-old is surrounded by scenes of the Huntington Beach good life, like couples strolling hand-in-hand on the pier, volleyball players on the sand, and surfers in the water. But Carltock’s life isn’t easy. He lives on Social Security and disability payments, which makes it hard to find an affordable place to live in this seaside community. More than half of residents in Huntington Beach are classified as rent burdened, according to the U.S. Census. “Well the price of rent and everything, it’s crazy,” said Carltock. Unable to find affordable housing, Carltock has resorted to living in his truck, parking overnight in different Huntington Beach neighborhoods. “I just try to fly under the radar, like a modern day saddle tramp,” said Carltock. Housing advocates say this affluent community of 200,000 people in north Orange County makes it harder for people like Carltock, and the the many low-wage workers in the tourist industry here, to find an affordable place to live in the community. Under a law passed in 1967, California cities are supposed to set aside enough new land to build new housing to keep up with population growth. More housing supply, it’s thought, will also bring down housing costs. But Sacramento says Huntington Beach has basically ignored the law and not made plans to build enough new housing. The State of California has filed a first-of-its-kind lawsuit against the city. Supported by newly elected Governor Gavin Newsom, who has pledged to create more housing in the state, the suit seeks to force the city to plan for new housing, or risk losing state transportation funds. Some say it’s time to play hardball with the city. “I think there needs to be political will to address the issue of housing, that we haven't seen that leadership happen there,” said Cesar Covarrubias, the director of the Kennedy Commission, a non-profit housing advocacy group in Orange County. Instead of planning for new housing, Covarrubias says Huntington Beach, in its most recent municipal plans, cut the amount of housing the city would permit from 4,500 units to 2,100. Cesar Covarrubias, Director of the Kennedy Commission, an Orange County Housing Advocacy Organization. Photo by Saul Gonzalez. 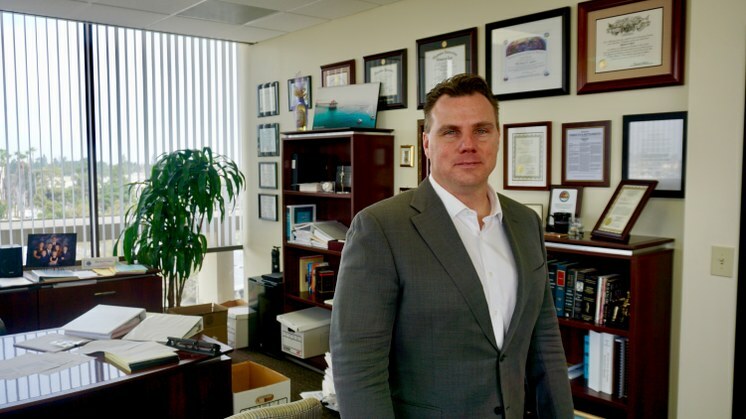 Huntington Beach city attorney Michael Gates says the state is meddling in local affairs and that under the state’s constitution, Sacramento has no authority over local zoning issues, like housing. Huntington Beach has filed its own lawsuit against the State of California. Huntington Beach also argues that it’s built housing in recent years and just needs time to absorb the additional growth before adding more units. “Sacramento clearly does not really know what's going on in Huntington Beach in terms of all of our progress,” said Gates. But a lot of the new development in Huntington Beach isn’t affordable housing. Take the newly opened Residences at Pacific City, where 500 apartments curve gracefully around a central pool, park and clubhouse complex. Rents start at $3,096 a month for a one bedroom. Back at the Huntington Beach Pier, Mike Carltock thinks Huntington Beach simply doesn’t want poor and working class people living within its city limits, even if many of those people work in the local restaurants, stores and hotels. 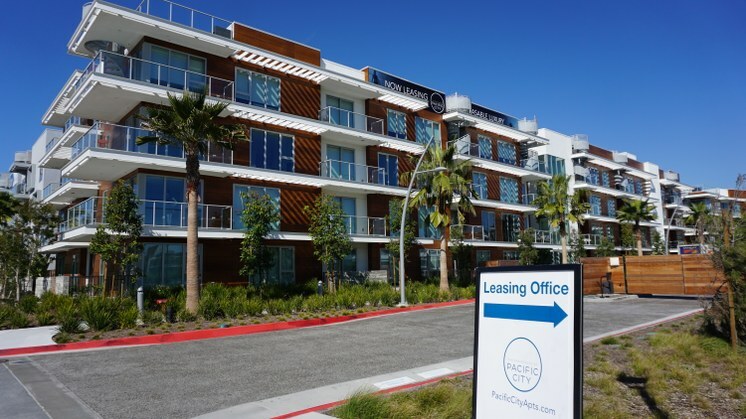 Huntington Beach isn’t alone in its reluctance to build new and affordable housing. According to the state, the community is just one of 47 California cities that haven’t met their housing targets under state law. 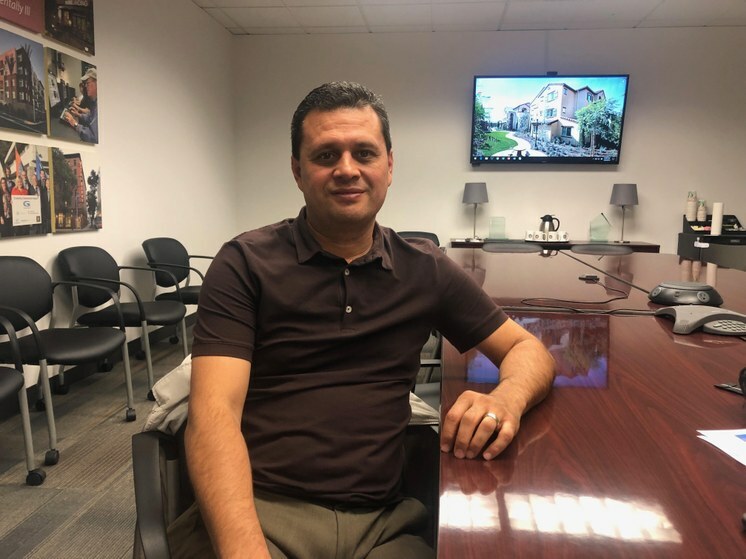 Housing advocates, like Cesar Covarrubias, say if these communities don’t start planning to get more housing built, they should expect Sacramento to start applying more pressure. In his first State of the State address Tuesday, Governor Newsom highlighted the state’s dispute with Huntington Beach. But he also offered an olive branch to cities that aren’t meeting their housing targets. The governor says he’ll convene a meeting with elected officials from the cities next week to discuss housing solutions.